9 Works Theatrical’s new production RENT opened this year’s local musical theatre scene last February 5, 2010 at the Carlos P. Romulo auditorium, RCBC Plaza, Makati City. 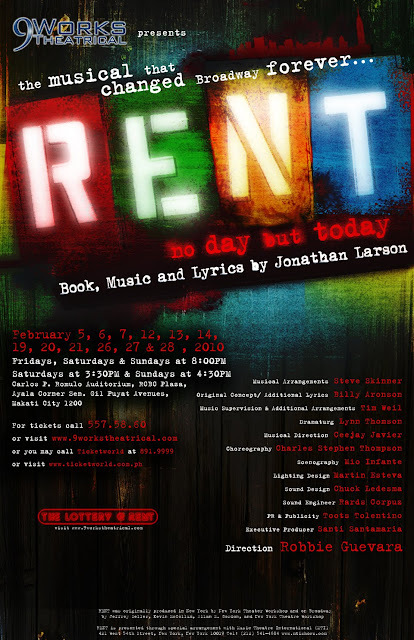 RENT is set in New York City's gritty East Village, and this revolutionary rock musical is an imaginative retelling of the classic Puccini opera, La Boheme. This unforgettable and timeless story of a group of starving artists, who, despite poverty and illness, learn to fall in love and find their voices, brings a universal message of hope for everyone. 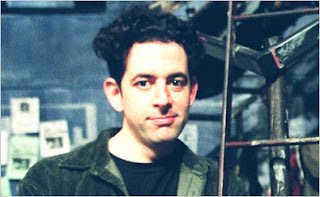 Robbie Guevara directs RENT . The cast includes Gian Magdangal as Roger Davis, a songwriter who is HIV positive; Fredison Lo as Mark Cohen, an independent filmmaker and Roger's roommate and Nicole Asensio as Mimi Márquez, an exotic dancer with HIV. The cast also features OJ Mariano as Tom Collins, a gay philosophy professor and anarchist with AIDS; Carla Guevara-Laforteza as Maureen Johnson, a bisexual performance artist; Noel Rayos as Benjamin 'Benny' Coffin III, the local landlord and a former room mate of Roger, Mark, Collins, and Maureen; Job Bautista as Angel Dumott Schunard, a gay drag queen percussionist with AIDS; Jenny Villegas as Joanne Jefferson, a lawyer, who is Maureen's partner; and Cara Barredo, as Mimi Marquez (at certain performances). Ensemble members include: Ring Antonio, Peachy Atilano, Johann Dela Fuente, Harold Cruz, Gary Junsay, Raul Montesa, Anna Santamaria and Mark Tayag. Show dates are: February 5, 6, 7, 12, 13, 14, 19, 20, 21, 26, 27 and 28. February 25, 2010 (Thursday) at 8pm. You can also call Jay +63.916.2613452 or Anna +63.917.8901103.